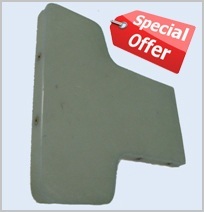 Price is valid for one piece, for the instrument panel from the mould, temperature cured and edges are trimmed. Made is according the drawing 6 RU 54. On the prescribed places the instrument panel has integrated brass nuts for fixing (brass while it does not affect to the disturbance of the compass). The instrument panel may be at a surcharge cutted with openings for the instruments, according to customer liking. Similarly, the instrument panel may be painted with the paint of the type Nextel. Instrument panels we have on the stock come with the Form 1 certificate. Later, new produced instrument panels would come with the company certificate of conformance.